This curved skeleton dress can be used to create a skeleton costume for Halloween and other spooky masquerade costume parties. 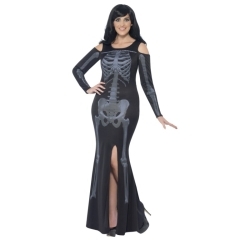 The curved skeleton dress adult costume is colored as pictured. Costume includes black printed dress with side-split. The curved skeleton dress adult costume is available in adult women’s size plus 1X.